Welcome to Wade Thomas and the Mustang Family! We know new families have lots of questions – and the Wade Thomas Parent Association has answers! Read on for a list of FAQs and helpful information for you and your child. When will we find out who our child’s teacher is? Class assignments will be sent via email to families on Tuesday, Aug. 22. The first day of school is Wednesday, Aug. 23. Can we meet other Kindergarten families before the first day of school? What does my child need on the first day of school? Your child will need a lunchbox, water bottle, and backpack to bring to school. The lunchbox should fit both a morning snack and lunch (Kindergarten students only need a snack). Nutrition is key to a great day! Please make sure your child has enough food to fuel for the day. Label containers to minimize lost items. What is the school day schedule? Kindergarten: 8:30 am – 1:55 pm with early dismissal at 1:45 pm on Wednesday. 1st through 5th graders: 8:30 am – 3:05 pm with early dismissal at 1:45 on Wednesday. Refer to the full bell schedule here. A “first bell” signals at 8:25 am so kids hustle to class and the “second bell” starts the day at 8:30. Students arriving into the classroom after the second bell might be marked tardy. If tardy, visit the office for a tardy slip. What are “Super Minimum” and “Minimum” days? These occur at the beginning of the school year and a few other times during the year. Depending on grade and time of year, dismissal is noon or 1:45. Speaking of Super Minimum days….! The first several days of school are on a modified schedule (see below). The district does this to ease the transition back to school and to accommodate intake conferences. Please plan accordingly for the short days and to attend your child’s intake conference. Conferences will be scheduled when school starts – this is a great way to share with your child’s teacher anything you want them to know heading into the school year. What’s the process for dropping off and picking up my student? Walk your child to class. Park your car (parking in surrounding neighborhoods) and walk your child to class. Wade Thomas has a carline at the Ross Ave entrance. You’ll want to ensure your child feels comfortable walking to class independently before using this option. I’d love for my child to have a hot lunch at school. Can I order this? Sure! You can order lunch on a schedule that works for you however many days a week you want, through choicelunch.com. Note: Kindergarteners won’t need lunch for the first several days of school so you’ll have time to check out the menu and get all set-up once the school year begins. KinderKool is a one week Summer camp held at Wade Thomas that introduces incoming kindergarteners to a kindergarten environment in a stress-free way. Kids build friendships with the students they’ll see in school and become familiar with the classroom and campus. Register for KinderKool through San Anselmo Recreation. Yes! The San Anselmo Recreation has a program at Robson After Care (RAC). And San Anselmo Preschool & After School runs a program on campus. I’ve heard there is a Spanish program. How do I get information about this? In 2017-2018 there may be a Spanish program offered to some grades by an outside agency called Viva El Espanol. Additionally the San Anselmo Rec may offer a class as part of their enrichment offerings. Please contact them directly for more information as these are still in planning phases or pending enough registrations. Are there After School enrichment activities right at Wade Thomas? Yes! The San Anselmo Recreation Department offers after school enrichment programs on campus such as art, chess, guitar, and more. For Fall activities visit the San Anselmo Rec website. What can I expect in terms of school expenses and fundraising? 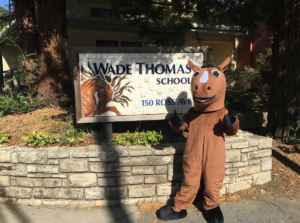 The Wade Thomas Lap-A-Thon – this is our school fundraiser, which covers school expenses such as PE equipment, emergency supplies, community-building events, campus beautification, assemblies, garden initiatives, and staff appreciation events throughout the year. Field trips – money will be collected at the beginning of the year to cover field trips. Birthday book club – when your child’s birthday month occurs you’ll have the option to contribute towards the purchase of books for the school. 5th Grade families are also engaged in other requests later in the year. In addition to your contribution to the WTPA, the YES Foundation – which provides a rich and extraordinary extracurricular program for the Ross Valley School District (art, music, library books, poetry, theater) – has a suggested donation of $750 per child for the school year. Please give as generously as you can. Should we purchase School Supplies? Wade Thomas has partnered with SchoolKidz to provide “Teacher Tailored” back-to-school supply kits for our students. Teachers have carefully created supply lists for each grade level and the supplies will be delivered to Wade Thomas before school begins. The purchase of these supply kits is not mandatory so please do not feel pressured to buy them, we are offering this option as a convenience to you. You are welcome to print the supply list from the SchoolKidz website, and purchase the supplies on your own. To purchase your SchoolKidz kit, or to print the supply list for your child’s grade level, please log on to the SchoolKidz website (www.shopttkits.com) and enter school account number 77610. Are scholarships available for expenses? There are! Scholarships are available for the field trip expense. For YES Foundation, while the suggested donation is $750, we recognize this doesn’t work for all families and ask that you give what you can. I’d like to volunteer in the classroom. How do I do that? Fantastic! Volunteering in the classroom is a unique way to observe your child, get to know classmates, and help out teachers. Each teacher has different classroom needs and you will be able to sign up during the first few weeks of school. Your teacher will provide you with more information as it is available. Interested in being a Room Parent? The WTPA will reach out for Room Parent volunteers at the beginning of the year. Sign up on your own, or partner up with another parent to share duties. I’d like to volunteer outside of the classroom. What can I do? There are so many ways to get involved at Wade Thomas. Our kids aren’t the only ones who have fun here! We welcome all who are interested to help, with jobs both big and small. Have a green thumb? Help out in our gardens! Have a passion for biking to school? Help out with Safe Routes! Want to learn a new skill? Try something new! Get in touch with the WTPA (Wade Thomas Parent Association) or attend a WTPA meeting to find out where you can get involved! How will I keep up on the latest news and events at school? Classroom udpates – Your child’s teacher will either send an email update or update a classroom website weekly. Look here for details on homework, class projects, and what your child is learning in the classroom. Wade Thomas Newsletter – Most Mondays at 2pm you will receive the WADE THOMAS NEWS by email. It is a collaboration between the WTPA and Principal and also includes updates from YES and more. It’s an important source of school information, often the primary source of all-school news, so you should definitely read it! WTPA website – check out wadethomasschool.org for everything you need to know about school wide events, programs, and parent resources. Room Parent emails – Room Parents will occasionally send emails with items that are specific to your child’s class (ie., parties, teacher gifts, etc.) and items that need to be communicated before the Newsletter is published. What is Back to School Night and what will I learn? Back to School Night will be on September 6th from 6:30-8 pm and this is your chance to hear from the Principal, be introduced to all teachers, learn more about the Wade Thomas Parent Association and YES Foundation, and most importantly, meet your child’s teacher. Your teacher will share all the learning that will happen this year, share important information about school routines and you’ll also get to sign up for various classroom and school volunteer opportunities. I still have questions…. Who can I talk to during the summer? What happens when the office is closed? Is there someone else I can get in touch with? The office will be closed from June 16-August 22. If you have a burning question, you can call the District Office. Or feel free to email our WTPA leadership. They will try to help you as best they can. Student portraits are taken by a company called Mugsy Clicks in early fall and you will get a few notices that this is happening. A class photo is taken in early spring and another reminder will come for this photo shoot as well. Where can I get my child some Wade Thomas gear (t-shirts, etc)? Are there other websites I should bookmark? Email Us (although we may be slow to respond over the summer). Get a taste for additional annual events here.